If you are too young for Medicare, chances are you have never heard of Gertrude Berg. In Yoo-Hoo, Mrs. Goldberg (2009), director Aviva Kempner sets out to right that wrong. In her day, before Lucy, before Oprah, she was Lucy and Oprah rolled together with a Tony award as a cherry on top. She originated a hit radio show, wrote and acted in it all through the Great Depression, and after WWII, carried the show to TV for many more seasons of success. 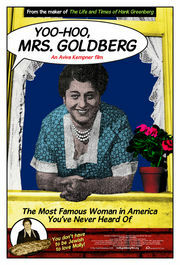 She invented the TV sitcom as we know it today in the form of The Goldbergs, which ran on television from 1949 – 1955 after almost 20 years on radio. She won the first Emmy for Actress in a TV Comedy, and later in her life, she won a Tony as an actress on Broadway. And we have never heard of this woman? I had a good time watching this documentary, and I am happy that it is available on DVD and from Neflix. However, it is a shame that Aviva Kempner did not dig deeper into her subject matter, because there’s another film underneath, a much more powerful and important film. Some of the best parts of the film delve into the hearings of the House Un-American Activities Committee and the Hollywood Blacklist that ended the career of Mrs. Berg’s co-star, Philip Loeb. I wish that Ms. Kempner had devoted the same degree of attention and passion to the question that underlies the entire story: why has Gertrude Berg been so nearly completely forgotten? We remember many film stars, all the way back to the silent era, and the stars of many a forgettable TV comedy that lasts a season or two: why not this Jewish woman who made such a mark in mid-century America? I would also be interested in knowing more about the reactions to her program outside New York and Los Angeles. In those days, anti-Semitism was rife in the United States, and yet this hit program was unabashedly Jewish. The only hint of this was a comment by actor Ed Asner, who comments that the Goldbergs were “too Jewish” to feel comfortable for him, as a young Jewish boy growing up in the Midwest. How did Christian viewers perceive the program, and how did it affect their view of Jews? The film also gives short shrift to Mrs. Berg’s home life, and how life might have been for a married woman who was working such long hours in those days. Her children were born in 1922 and 1926, and her radio show first aired in 1929. How did she do it? What was the real Berg family like? Kempner assures us that her marriage to Berg was a love match, and little is said about the children, but I could not help but think that there was a much more interesting story somewhere under the glossy exterior. So yes, it is a fascinating film, but it left me wanting more. Do you remember The Goldbergs? If so, what memories does it bring up for you? When you watch the clips of The Goldbergs in the film, how do you feel about the way those characters were portrayed? Would you like to see re-runs? What do you know about the Hollywood Blacklist? How many Jews were on it? I Love Lucy appeared on TV the year before the The Goldbergs was cancelled. Do you have any theories about why Lucille Ball is remembered and Gertrude Berg is not? Can you imagine a re-make of The Goldbergs on TV today? Who would you cast? Where would it be set? This entry was posted in United States and tagged Documentary, Jewish Identity, Jewish Women. Bookmark the permalink. Just rented this! Thanks for the recommendation.